I’m interested in what makes people tick. Conversely, those who attend my speeches, follow my columns, or read my books usually appreciate knowing a little about my story. This is especially helpful to those who need to introduce me to a group or who need to check my credentials for some reason. Half-Page Version of my Curriculum Vitae. 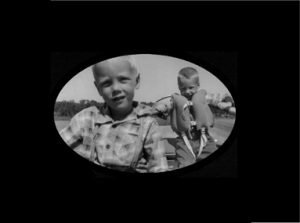 PHOTO: Family snapshot of myself (left) and my twin brother taken in 1956 when we were five years old. We were investigating Lake Union in Erskine, Minnesota. Such lakes have been an important part of my family and professional life.